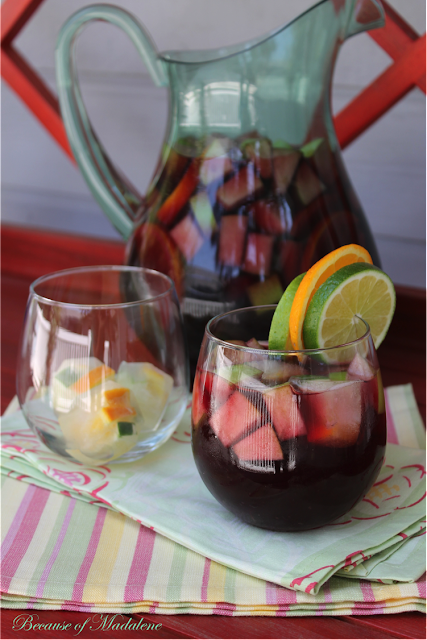 Sangria is the drink that both winos and not so winos love. A party pleaser that can satisfy everyone's drink tastes without having to come up with a bunch of other beverage ideas! 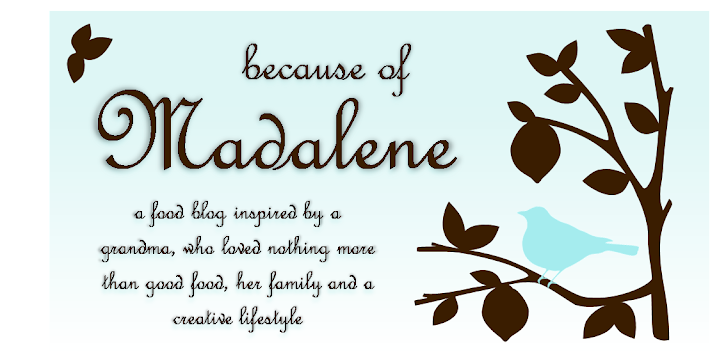 And it's so much fun to make because the ways to mix it up are endless. This time around was super simple but very effective in more ways than one. :P Because the wine is more acidic tasting, I wanted to break that up with a lot of citrus and tang by adding Squirt and cranberry juice. And the best part of it all... the fruit! Lots and lots of fruit. Because after you take that last sip of Sangria, you have a wine soaked snack at the bottom of your would-be-sad-empty-glass on any other regular day. Not only did I stuff the pitcher with diced up crispy anjou pears, granny smith apples, limes and oranges but also froze small slices of limes and oranges in hexagonal shaped ice cubes to keep the drink chilled in a fun way. Nothing to it, just throw all the prepared fruits and fluids in a pitcher, cover and chill over night or four hours before serving. 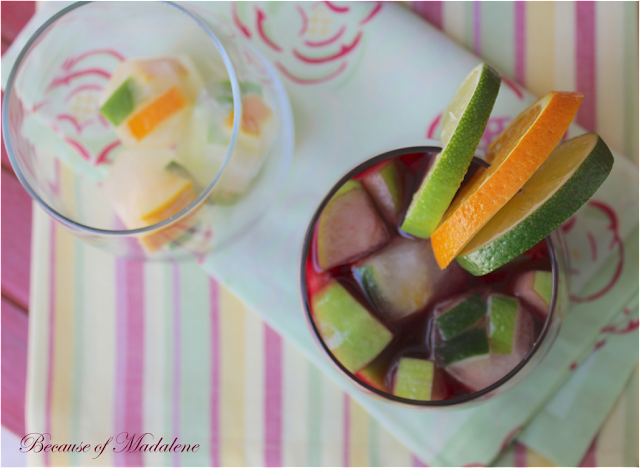 This amount of time allows the fruit to soak up all the flavors of the Sangria. Serve over the fruit filled ice cubes, garnish and drink up!